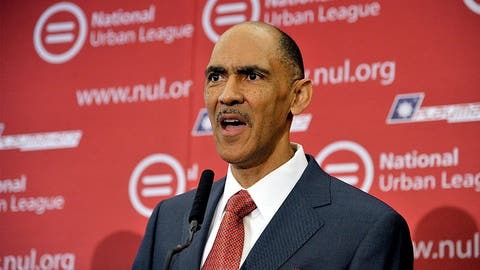 Former NFL coach Tony Dungy is one of the bigger names reportedly victimized in a scam to hoax coaches into believing they were being offered high-profile jobs. A Los Angeles man is reportedly in jail on an eavesdropping charge. A Los Angeles man is in jail, accused of pranking big-name coaches into thinking they were being offered jobs, NBC News reported Monday night. Citing authorities and sheriff’s booking records, NBC said that Kenneth Edward Tarr, 32, was booked into LAPD’s Hollywood Division jail on suspicion of felony eavesdropping and is being held in lieu of $20,000 bail. The report stated that the charges stem from accusations of illegally recording phone conversations with the sports figures without their consent. According to the report, police believe that there are at least a dozen victims from the NBA, NFL and college football coaching ranks, including Vikings head coach Leslie Frazier, Chargers offensive coordinator Ken Whisenhunt and University of Hawaii head coach Norm Chow. The report also said that former Colts and Buccaneers head coach and current NBC analyst Tony Dungy was a victim; authorities say Tarr called Dungy and offered him the head coaching job at USC. Tarr is accused of bragging about his actions in web postings, NBC reported, one time telling Deadspin, "I’m like the world’s most safe criminal," after an alleged incident involving Golden State Warriors coach Mark Jackson. Tarr is accused of posing as an employee of the Lakers and discussing the franchise’s head coaching vacancy with Jackson. "Our investigation is ongoing and includes coaches from across professional sports," LAPD Lt. Mark Reina told NBC. "We will be analyzing evidence taken during the service of our search warrant to determine if there are additional victims we are not aware of." While authorities would not tell NBC an exact number of schools, franchises and people impacted in the case, authorities say other alleged victims in the case include Bengals offensive coordinator Jay Gruden and college football head coaches Mike Riley (Oregon State), Sonny Dykes (Cal), David Shaw (Stanford) and Dabo Swinney (Clemson). The case will next be presented to prosecutors, with charges reportedly possible as early as Wednesday.